Mr. James made the remarks at a police press conference last week. He said bus drivers have specified routes they ought to follow and normally get into trouble when they stray from those areas. “The passenger bus drivers have a bus route and they are designated routes they should travel and so normally when they are off the bus route and encounter the police officers they receive tickets and this is what they are talking about being harassed by the police,” he said. He praised Corporal Alisson Rouse who has been an officer and who, he says, has kept the busmen in line. “This is an officer who does a real good job in our city, and I think this officer must be highly commended. This is an officer that does a good job and issue tickets. If we had two or three more officers like her I think the government would be very glad, because of the revenue increase and we would have good traffic around Basseterre,” he said. Mr. James dismissed the notion that police have been targeting the bus drivers. “I don’t think the officers are harassing the bus drivers and I think that is a vague general statement,” he added. 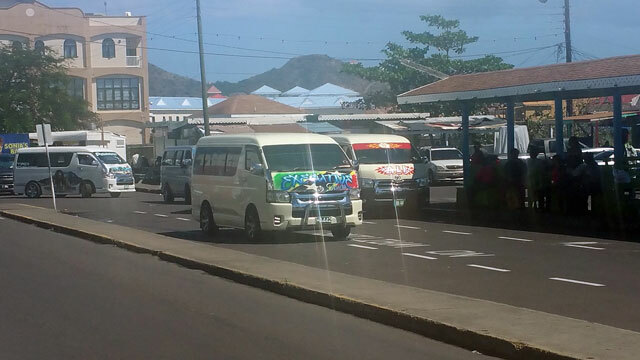 Last week bus drivers from across St. Kitts threatened strike action and cited as one of their concerns harassment by the police. They were also unhappy that the government for many years have been ignoring their issues. “Instead of then talking to us and listening to our cries they seem to be shutting us out and so we decided to take drastic actions. We basically have no contact with them. We try our best to contact them, they promise many times to call back to do meetings with us and all kind of stuff but we never get a call back,” said Bernard Bolan president of the Sugar City Bus Association. Last week in response to their proposed strike action Minister of Transportation the Hon. Ian ‘Patches’ Liburd addressed some of the concerns stating he met members of the Transportation Board. “I can also report that I have spoken with the Chairman today (Feb. 21) of that board, and they are going to meet next Tuesday (Feb. 28) to deal with the issues as it relates to road transport, traffic safety, public service vehicles and public service drivers, among other things,” he said. He stated the board is also mandated to advise the Minister on transport rates, fares, tolls, dues and other charges. “So I would await that advice from the Board in terms of dealing with the issues that face us,” he said. Mr. Liburd said the government is investing $6 million in a modern terminal for East Line buses and to other facilities. “Although the government is spending millions of dollars on the improvement of these facilities, they come at no cost to the bus drivers, owners or the taxi operators,” he said. He added that concessions are also given to the bus drivers when importing vehicle for public use. “In fact, duty free concessions in the amount of 45% is granted to taxi owners and bus owners. And this is 45% of the CIF value. So, government therefore forgoes a high amount of revenue to ensure that commuter buses and taxis are here to provide a very essential service for us as a country,” he said. Liburd also indicated some concerns he had with the sector as well.